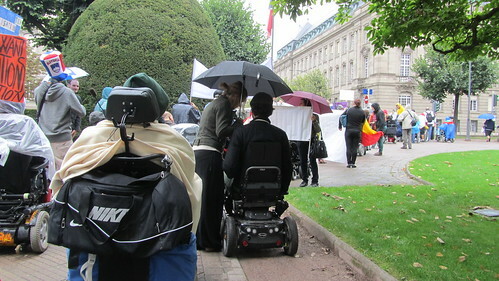 Sisters of Frida members were in Strasbourg to join ENIL (European Network of Independent Living) Freedom Drive. Zara Todd was there as a member of the young ENIL group, and chaired the session Rejuvenating the Independent Living movement. It was heartening to see the leadership of young people at this meeting. We also took part in the march to the European Parliament from Place Republique even in the pouring rain. About a hundred disabled people with their supporters chanted and wound their way to the European Parliament – this is the 6th procession. It has been happening every 2 years. Sisters of Frida and allies! 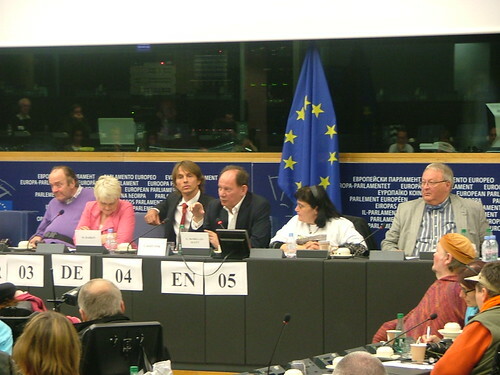 When we got there we went into the big meeting room to meet out MEPs but it was disappointing this time because very few of the MEPs were there inspite of the fact that many of the disabled people had travelled long distances to get there. The Chair of the Disability Intergroup, Adam Kosa, did not bother to turn up, sending the excuse that he had no sign interpreter. For the UK, Richard Howitt (Labour) and Jean Lambert (Green Party) came to address us – Richard was obviously apologetic that we were treated so shabbily. Many of the Irish MEPs came and Martin Noughton leading the meeting from the floor suggested that Adam Kosa should resign and that we should have a sit in. Adolf Kadzka said he was fed up of being patted on the head and coming there to Strasbourg every 2 years without making any progress. E mails and texts were sent out to other MEPs and more started to arrive, notably E McMillan-Scott (Lib Dem, previously Tory). He is the European Vice President, he told us he did not know we were there, even though all MEPs were informed. Interestingly enough his portfolio is human rights and democracy : ‘active involvement in the Arab Spring, as well as his leadership of the Single Seat campaign to end MEPs’ monthly trek from their base in Brussels to their official ‘seat’ in Strasbourg’ – what about our human rights? he spoke about the cost of the monthly trek and asked for some reps to be introduced to European Parliament chamber (discussing the topic of Syria at the moment). Richard Howitt came to rejoin us after the big meeting and we spoke about the austerity effects in the UK at present time. He was questioned on Labour’s stand on welfare reforms, and was told that disabled people was not certain that there was much difference between the two parties. He was sure that Labour would not have chosen to cut welfare so drastically. 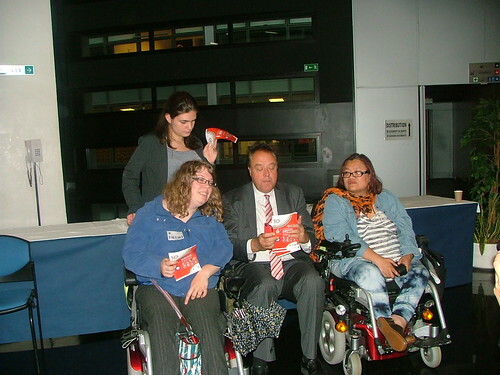 He apologised again for the bad reception from the Disability intergroup. He would welcome being invited to speak at disability groups in the UK and events in London, possibly but everything dependent on his availability. 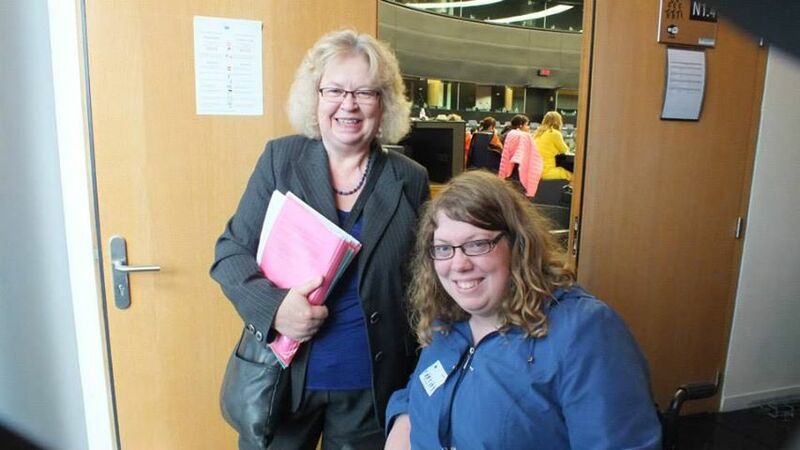 Zara had a good talk with Jean Lambert as her MEP on disabled women issues. It was a good experience for all of us in Strasbourg.